Additional research provided by David Stick. See also: Otway Burns, Snap Dragon; Wasp. Disputes between the United States and Great Britain over neutrality laws, the impressment of American sailors by British warships, and the suspicion that the British were inciting Indian wars on the American frontier caused Congress to declare war on Britain on 18 June 1812. North Carolina governor William Hawkins quickly notified President James Monroe that the state would cooperate fully in executing the war. North Carolinians served in both the regular army and the militia during the war. When the conflict began, the regular army had fewer than 7,000 troops; when it ended, there were more than 38,000 regulars. The 10th Regiment contained the most North Carolinians, although men from the state served in the 12th, 13th, 15th, and 43rd Regiments as well as the 2nd U.S. Artillery and other units. The U.S. military planned to invade British Canada, defend the coast against British incursions, and protect the frontier from Indian attacks. America suffered a great setback when Gen. William Hull surrendered Detroit, with 2,000 U.S. troops, to the British on 16 Aug. 1812. His defeat inspired stronger support for the war effort in North Carolina. In Mecklenburg County, 100 men who were past militia age, including many Revolutionary War veterans, drilled at a militia muster and pledged, if it became necessary, to fight the British a second time. After Hull's disaster, Americans were heartened by news of the brilliant exploits of the U.S. Rifle Regiment and one of its officers, Capt. Benjamin Forsyth of North Carolina. Forsyth led his men on scouting missions, skirmishes, swift raids, and assaults in larger army operations, such as the capture of York, Ontario (modern Toronto), on 26 Apr. 1813, and rose to the rank of lieutenant colonel. He was killed in battle at Odell Town, Canada, on 28 June 1814. Forsyth County is named in his honor. Although U.S. forces suffered numerous defeats and disappointments on land, a string of victories at sea made many Americans into long-remembered heroes. Capt. Johnston Blakeley was an Irish immigrant who had for a time made North Carolina his home. His ship, the Wasp, won single-ship duels with the British warships Reindeer and Avon and captured several valuable merchant vessels. On a cruise in 1814, the Wasp disappeared without a trace. In consideration of Blakeley's service, his widow and daughter received generous pensions from the General Assembly. American privateers captured or destroyed many British vessels during the war. The most famous was the Snap Dragon, whose captain was Otway Burns of Swansboro. On his first voyage in 1812-13, Burns seized eight vessels; on his second voyage in 1813, the Snap Dragon returned so full of loot that the crew was forced to sleep on deck. British naval vessels and privateers harassed coastal shipping throughout the war. As the federal government was unable to spare enough troops or ships to protect the North Carolina coast, the state militia assumed most of the burden for its defense. The British sent landing parties ashore at several places. In November 1813 three barges of armed men from the British privateer Mars captured several American vessels anchored at New Inlet. The British were foiled by the local militia, which managed to capture one barge and drive off the others. In another large raid in October 1814, this time against Currituck Inlet, the British captured three ships and burned three more but left as the local militia arrived. In the most serious attack against North Carolina during the war, Ocracoke and Portsmouth were captured for a few days in July 1813. A British fleet, consisting of a large warship and assorted smaller craft (19 barges, according to one observer, each carrying 40 men) under Adm. Sir George Cockburn, reached Ocracoke about 9:00 p.m. on 11 July. In short order, the British seized the town of Portsmouth on the south side of the inlet, Ocracoke on the north side, and the maritime base known as Shell Castle in the middle. Although the British captured two privateers, the Anaconda and the Atlas, the revenue cutter Mercury outran the enemy ships, reaching New Bern in time to thwart any surprise strike on the mainland. News of the British invasion spread, and militia companies from as far away as Raleigh quickly marched to guard New Bern and other coastal towns. The British remained at Ocracoke and Portsmouth, looting and vandalizing homes and rounding up provisions and livestock, until 16 July, sailing before the militia could reach Ocracoke. The commander warned that the entire North Carolina coast was under blockade, but there is no indication that the fleet ever returned to enforce it. Governor Hawkins later requested, but failed to receive, federal help in building and manning forts to protect the state from another British invasion. As the war dragged on, more North Carolina militiamen were called into service. In early 1814 about 1,000 men from the western counties, under the command of Col. Jesse A. Pearson, marched from Salisbury to take part in fighting against the Creek Indians in Georgia and Alabama, but they arrived too late for more than garrison duty and some punitive raids. After the British burned Washington, D.C., on the night of 23-24 August, the federal government called up another 7,000 North Carolina militiamen. Two North Carolina regiments were sent to Norfolk, which was feared to be the target of an enemy attack. The North Carolinians witnessed a British naval bombardment but did not take part in any fighting; kept in readiness until the end of the war, they lost many men from disease. Other militia companies were sent to protect New Bern and Wilmington. The War of 1812 came to an abrupt end when the Treaty of Ghent was signed on 24 Dec. 1814. Orders had been issued for another regiment of North Carolina detached militia to rendezvous at Wadesboro, travel to the Mississippi Territory, and join forces under Gen. Andrew Jackson. The general smashed a British army at the Battle of New Orleans on 8 Jan. 1815 before news of the treaty reached America, and the Wadesboro rendezvous was canceled. Despite the humiliating disasters, bad luck, and poor leadership that beset some of the American forces, most North Carolinians supported the War of 1812. Approximately 1,200 residents volunteered for the regular army. Federal records indicate that 18 North Carolina soldiers were killed in action, and many more died from disease. The war had few direct lasting effects on the state, which was far from most of the fighting, as militia units were rarely sent outside of their own boundaries. Indirectly, however, ending the threat of Indian wars and foreign intervention in the trans-Appalachian South paved the way for increased out-migration from North Carolina as dissatisfied citizens sought better opportunities in the west. William S. Dudley, ed., The Naval War of 1812: A Documentary History, vol. 1 (1985). Sarah McCulloh Lemmon, "Dissent in North Carolina during the War of 1812," NCHR 49 (April 1972). Lemmon, North Carolina and the War of 1812 (2000). War of 1812 Bicentenntial 2012-2015. North Carolina Department of Cultural Resources. 2011. http://nc1812.ncdcr.gov (accessed August 20, 2012). "The War of 1812." LearnNC.org. http://www.learnnc.org/lp/editions/nchist-newnation/4531 (accessed October 11, 2012). "British Invasion." North Carolina Highway Historical Marker Program. http://www.ncmarkers.com/Markers.aspx?sp=search&k=Markers&sv=B-19 (accessed October 11, 2012). Film: The War of 1812, PBS. http://www.pbs.org/wned/war-of-1812/film/watch-film-and-bonus-features/ (accessed May 5, 2016). The War of 1812. UNC-TV. 1:53:13. October 10, 2011. http://video.unctv.org/video/2089393539 (accessed October 11, 2012). 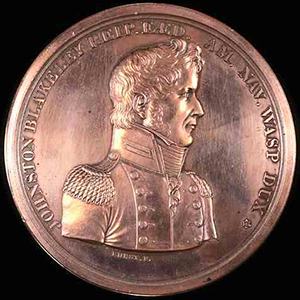 "Commemorative Medal, Accession #: H.19XX.320.4." 1814. North Carolina Museum of History.